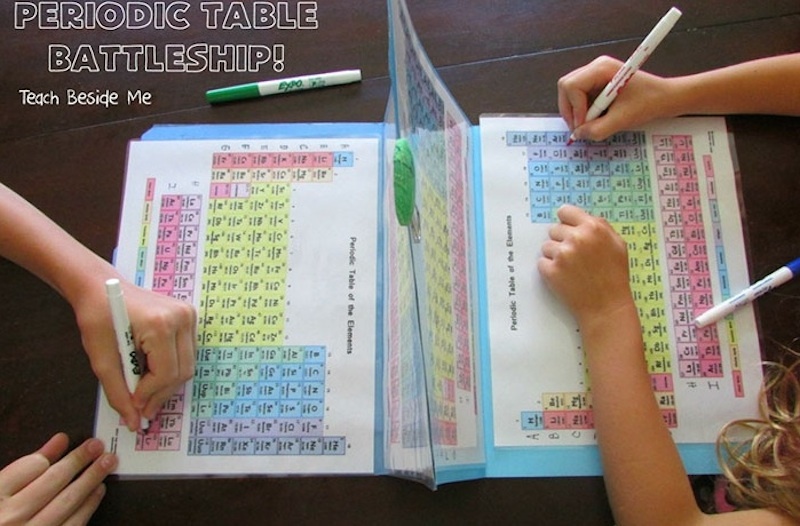 If playing games together is a beloved activity in your family, we’ve got a suggestion that will put a little chemistry into the mix: periodic table Battleship! Former school teacher and current homeschool teacher and mom of four, Karyn Tripp, came up with this fun and playful way for kids (and… ahem… parents who may have gotten a little rusty on all those acids and bases) to bone up on their periodic table elements using the same concept as the beloved classic game. Karyn constructed the “board” using a file folder and two sets of printed off and laminated period tables that have been labeled vertically down the table’s left side. The tops of the folders are paper-clipped together back to back to keep them upright. The periodic table game follows the same basic instructions as the original: kids mark off their “ships” by circling several elements on the lower table with a dry erase pen, then they call out element numbers and the letter or number on the left side (or element names) to try and sink the other team’s battleship. Using a laminated version allows for multiple play sessions — kids can just wipe off the board and choose again once their battleship has been sunk. Even if your child is far from ready to learn about chemistry, she can still play this game… and maybe subconsciously prime that little noggin’ for some future chemistry greatness. If playing games together is a beloved activity in your family, we've got a suggestion that will put a little chemistry into the mix: periodic table Battleship! Former school teacher and current homeschool teacher and mom of four, Karyn Tripp, came up with this fun and playful way for kids (and... ahem... parents who may have gotten a little rusty on all those acids and bases) to bone up on their periodic table elements using the same concept as the beloved classic game. Karyn constructed the "board" using a file folder and two sets of printed off and laminated period tables that have been labeled vertically down the table's left side. The tops of the folders are paper-clipped together back to back to keep them upright. The periodic table game follows the same basic instructions as the original: kids mark off their "ships" by circling several elements on the lower table with a dry erase pen, then they call out element numbers and the letter or number on the left side (or element names) to try and sink the other team's battleship. Using a laminated version allows for multiple play sessions -- kids can just wipe off the board and choose again once their battleship has been sunk. Even if your child is far from ready to learn about chemistry, she can still play this game... and maybe subconsciously prime that little noggin' for some future chemistry greatness.